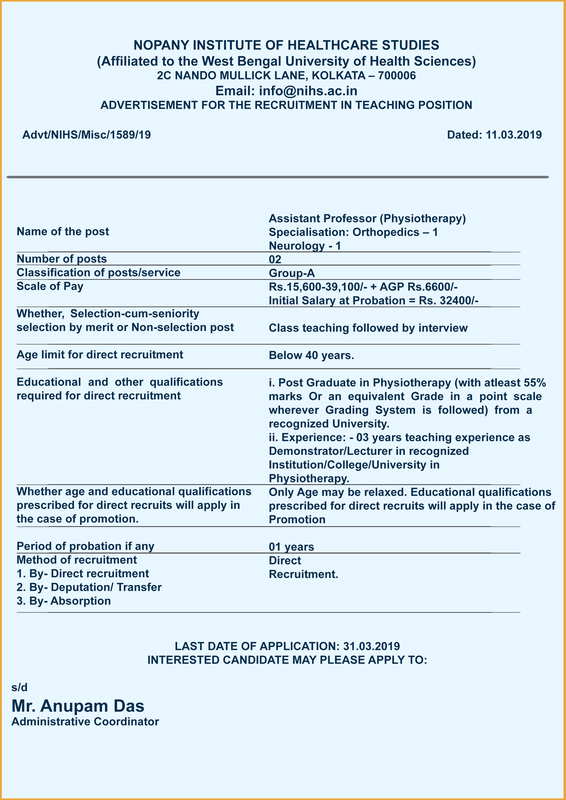 in association with AMRI Hospitals Ltd.
NIHS is the first private physiotherapy college in Kolkata offering Bachelor of Physiotherapy and Master of Physiotherapy courses. 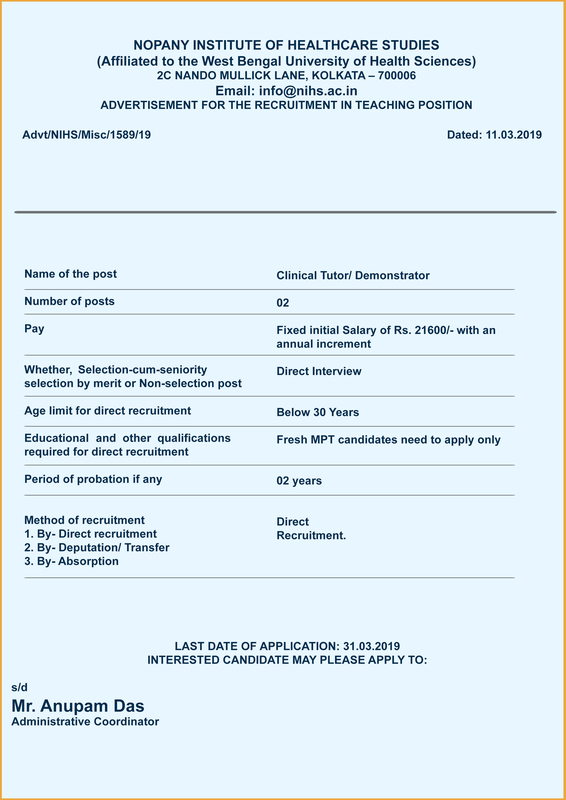 It is recognized by the Department of Health and Family Welfare Government of West Bengal, the Indian Association of physiotherapists and affiliated to the West Bengal University of Health Sciences. All programs at NIHS have been carefully designed with a comprehensive curriculum and hands-on practical training preparing them thoroughly for a professional career in Physiotherapy. College Office remain closed from 16th October, 2018 to 21st October, 2018. NSporte – Team NSporte provide Physiotherapy Assistance to Bengal Rugby team and Indian Women Rugby team at CCFC club. Link N Sporte CCFC photo from gallery. MOU was renewed for student training and internship with AMRI Hospitals Ltd.
NIHS conducts Parent Teacher meeting with parents and guardian of 1st BPT batch on 5th April, 2018 at college auditorium. NIHS concluded its 9th Ethic Committee meeting successfully. Dr. Shabnam Agarwal received scholarship awards at World Congress on Osteoporosis Osteoarthritis and Muskuloskeletal Diseases (WCO) - 2018 Krakow - Poland. Dr. Shabnam Agarwal - Director Education NIHS, presented two poster at World Congress on Osteoporosis Osteoarthritis and Muskuloskeletal Diseases (WCO) - 2018 Krakow - Poland. NIHS students attend OMPTCON at New Delhi and win prizes and accolades. Dr. Shabnam Agarwal - Director Education received awards for Best Academician in OMPTCON. NIHS 13th Annual Day was held at GayanManch on 7th February, 2018. Dr.Shabnam Agarwal, Director Education , NIHS received Nari Shakti Award in recently concluded SPORTSCONNECT a conference focused on Musculoskeletal and Sports. Free Mobility aids was distributed at Mollarpur, Birbhum District. In continuation of Free Physiotherapy assessment and Mobility aids distribution camp on 17.11.2018. We organised a program to distribute the mobility aids as per the requirement of the patient. The program was conducted at Sri RamkrishnaSatyananda Ashram. The BDO of the area was also present. We distributed nearly 37 mobility aids on that day. The event was organised in association with Rotary Club of Calcutta, Chowrenghee. NIHS intra-college competition which include Song, Dance, Sports, Recitation, Drama, Drawing was organised on 7th, 8th and 9th December, 2017. The students were dived in 4 houses viz., (Red Rose, Yellow Marrigold, White lilly and Violet Rhododendron), all the events are competitive and all students participate as per their own choice and skills. This year‘Violet Rhododendron’ won the champion trophy. On 155th birth Centenary of Swami VivekanadaJi NIHS conducted 'Free Physiotherapy Camp' at KMC ward office 26 on 12th January, 2018. NIHS and its team successfully organised SIPCON 2018 in Kolkata. SIPCON is an international conference organised by Society of Indian Physiotherapists. The conference was held at Novotel, Rajarhat, Kolkata on 26th to 28th of January, 2018. The students of NIHS performed a cultural show at the opening ceremony of the conference, which was appreciated by all. Dr. Shabnam Agarwal, Director Education of NIHS was the organising secretary of this conference. Being a student of the same institution during my BPT I had no doubts in mind , where I have to do my MPT. NIHS was always my first choice. The care and help I received from faculty members during my BPT studies helped me to choose this institution. The method of teaching MPT students here is loved by all of us. I come to know about this institution from internet and feedback from my relatives who resides in Kolkata, helped me to choose this institution. I did my BPT from Dhaka university and after joining the institutions to pursue my masters, I was little frightened because the country is new to me, new people, but the students and faculty members never made me feel as foreigner. I am enlighten by the knowledge I gained during my study period. My brother being a student of NIOH Kolkata,gave me the choice to take admission in NIHS. The college is good and faculties are really good their class are very much interesting and explain things very clearly. Hostels was an issue initially but I got adjusted soon. Now my best friends are my hostel mates. Thank you NIHS. I am obliged to be a part of this college. The teachers here are really helpful. I have got a lot of exposure through this college. I love this college. I always wanted to help people and physiotherapy is the best profession to help reduce the pain and agony of people. NIHS will not only help you to excel in study but also inspire you to do the best in other part of life through different social and cultural activity. Sports days are my favourite. NIHS is the best physiotherapy institution of Kolkata , West Bengal with most experienced faculty members and well maintained clinic. NIHS gives 100% result in university examinations. It has given me vast knowledge on physiotherapy and changed my perception regarding the subject. This is the institution where I am pursuing my dream. As a student I gained here everything, which I needed. I am thankful to all teaching faculties who are extremely helpful and supportive. The well equipped clinic here provides a great exposure to the patients. I must say that if anyone really want to dive into a world of physiotherapy then NIHS is the right place to start with. I am proud to be a Nopanian. 4 ½ years of college seemed so long when I first started out, but it turned out to be a splendid journey with the support of faculties and cooperation of friends. This college had prepared me as a person I need to be for my profession and my life. My college life has been a mixture of fun, joy, stress, struggle and learning which I am glad to have experienced. I am proud to be a student of NIHS. It is the place which has made me what so ever I am today. The faculty not only helped me with academics but also shaped me into the whole grown physiotherapist. Institute provides internship at different hospitals which gives a good exposure and knowledge to the students. Institute time to time organises interactive sessions like case presentations, seminars etc which helps in learning and boosting knowledge. I came across the college over the internet by coincidence, and it turned out to be a good one. NIHS has been an eye-opener in more ways than curricular. It is a place to grow and realise oneself: a journey through self discovery. NIHS has provided me enormous knowledge of physiotherapy and changed my concepts regarding the subject. It has made me realize the need of physiotherapy in today’s fast paced lives. The clinic is well equipped and provides many practice sessions. Seeing patients improve is very motivating. The library is well stocked. 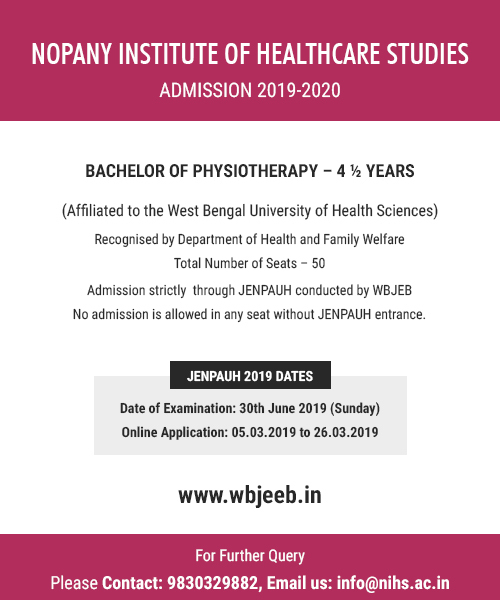 NIHS is considered as one of the best physiotherapy institutes under the West Bengal University of Health Sciences, with renowned faculty members, well maintained clinic and library. It’s a very good experience studying at NIHS. The administration is very effective when it comes to solving problems of the students. I am very much glad to be a student of NIHS. 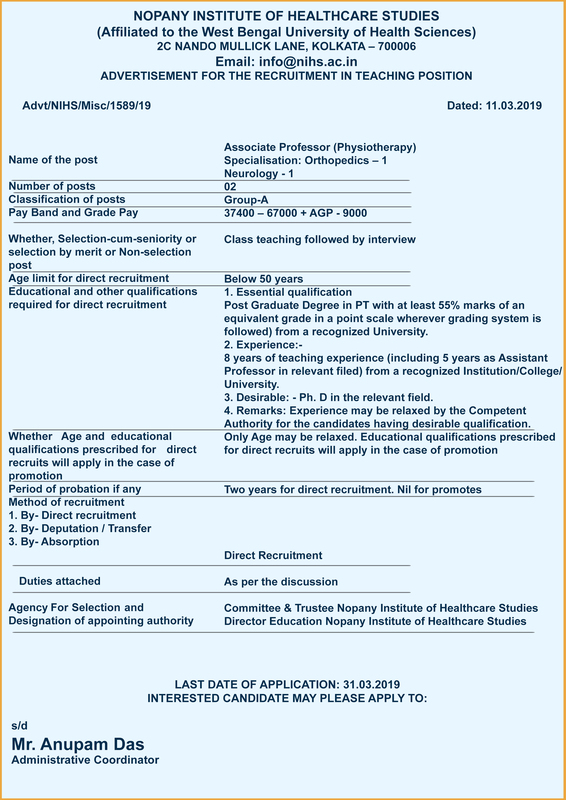 It is the best institute of Kolkata for physiotherapy education. There is a well-stocked library, highly skilled teaching staff and well equipped physiotherapy clinic. The students obtain best results in university examinations every year. I am proud of my college. I consider myself fortunate to be studying a unique course in one of the finest professional colleges of Kolkata. It offers a warm welcome to overseas students. It has a well- stocked library, clinic and laboratory which make learning easier and interesting. Continuous assessments are conducted through assignments quiz, etc. constant guidance and support is offered by the academic staff. I always wanted to be in medical fields. At NIHS, I have learned all that I needed as a student, from better educational to extra curriculum activities. We get Inspiring professors and a good library where you can sit and study. What else a student need!! NIHS is a place of knowledge, which taught me all the many lessons I have learnt, not just studies but also the responsibility as a physiotherapist, how to serve the needy and the ones with pain. I thank all the talented teachers, who have changed my life and helped me to become one of the professionals. It is indeed the most memorable experience in Kolkata. I am glad to be a student of NIHS. It is the best institute of Kolkata for physiotherapy education. It provides all the opportunities to its students for study. There is highly skilled teaching staff and well equipped physiotherapy clinic. The student obtains best results in university examinations every year. I am proud of being Nopanians. 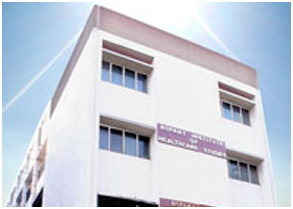 I chose this institute because I wanted to be a physiotherapist and this is one of the best institutes in West Bengal. This institute has an excellent faculty with appropriate access to clinical knowledge. I chose NIHS because the faculty and infrastructure of this college is very good. The placement records and academic results of NIHS are also very good. Moreover we get a homely atmosphere here and the faculty are friendly and supportive. Copyright ©2011 Nopany Institute of Healthcare Studies. All rights reserved.